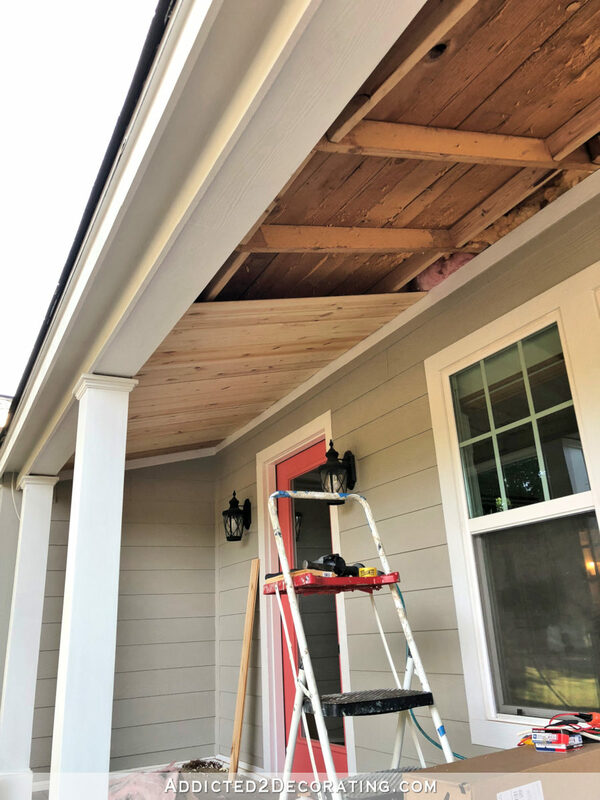 I finally decided it was time to get my front porch ceiling installed, and to seal up those areas where my attic is open to the great outdoors. When we bought the house, about half of the house was covered in vinyl siding, but the front porch ceiling had metal (aluminum?) siding over the original wood shiplap siding ceiling. But that ceiling was removed last summer when we had the new siding installed. Ever since then, I’ve been looking at those not-so-pretty rafters with some wide open spaces between them that allowed for free access directly into the attic. They weren’t pretty or perfectly straight 😀 , but they didn’t need to be. As long as they were securely nailed between the rafters, they would serve their purpose. So yesterday, I got busy cutting the boards (I’m using these tongue-and-groove boards from Home Depot) and nailing them up using the longest 16-gauge nails that my nail gun would use, which I believe was 2.5 inches. Before I started installing them, I wasn’t quite sure how I wanted these boards finished. Stained? Painted? I hadn’t decided for sure one way or another. But after installing a few boards, I decided for sure that stain was out of the question. I think I have enough stained wood with the porch floor. But also, I’m not too crazy about the drastic differences in coloration of the wood, with the really light lights, and pretty dark darks. 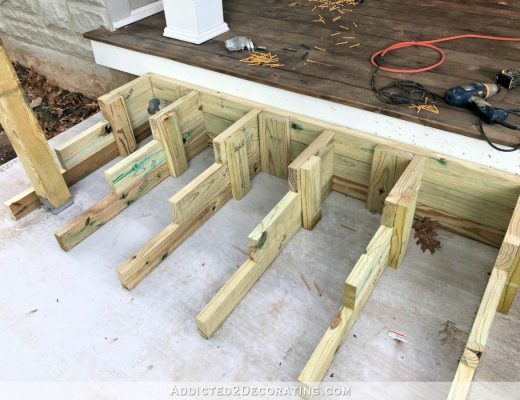 It makes it look like the boards are installed with random spacing in some areas, so accenting that with stain is the absolute last thing I want to do. So paint it is! And I think that’ll look great. I’m hoping to get the rest installed today, and I’d love to get it painted. But I’m not quite sure what color to use. White? Blue? Blue porch ceilings come in all shades of blue and blue-green, but I’m partial to the lighter ones. 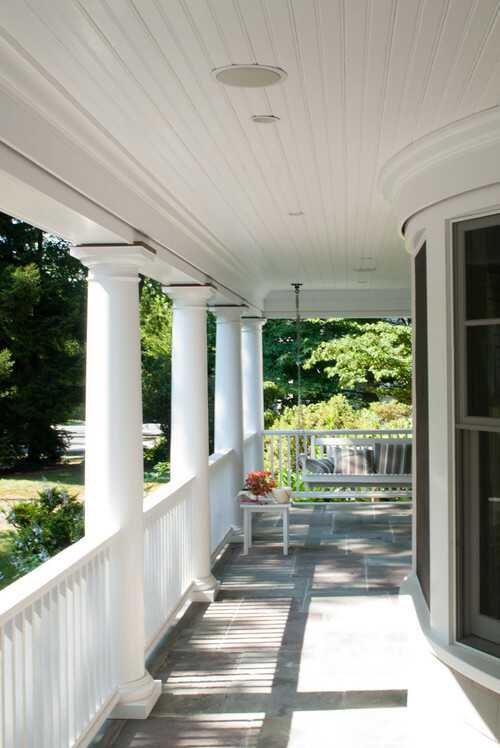 But of course, I don’t think you can go wrong with a white porch ceiling, especially on a house with white trim like mine. It keeps things looking light, bright, and clean. The first place I saw a light blue ceiling in a porch was at the Grand Hotel on Mackinaw island in northern Michigan, so I don’t associate it with the deep South. I painted my porch ceiling in Pittsburgh light blue and I love it. LOVE the Grand Hotel but I have always thought the porch ceiling color is too aqua and a little too dark. It strikes me as somewhat garish for the setting or a color that would perhaps work better in the tropics than in northern Michigan. I love the lighter blue/blue-green porch ceilings! They are common on the coast in New England even though a southern idea. Way back, I had a friend say. “Well, you can’t go wrong with blue above and green below. It’s what God did.” She was right. Not that other things aren’t possible. But I do love the pale blue. Does some company actually carry ‘haint blue’? I’ve never seen an actual paint color called Haint Blue from any of the brands that I use (Behr, Benjamin Moore or Sherwin Williams). Blue will also discourage mud daubers and wasps, the reasoning behind it is they think it is the sky. Dixie Belle Paint Company has the color Haight Blue. I just discovered this company today. They do have some lovely colors. I have not used this paint just wanted to let you know if you want to check it out. Sorry, I meant “Haint Blue”. I’d definitely go with a very light haint blue. Classic and beautiful. Lived in Houston for years and after lots of issues with wasp nests under porch ceiling we were told blue would keep them away. Blue it became and far less an issue. Loved our blue ceiling. My screened-in back porch has a light sky blue ceiling. I love it. I think I’d prefer a sky blue to a green-blue. With the way you love color, I’m surprised you’d even think about white! LOL! Blue for sure! Oh, go with the blue or blue-green. May I suggest you make it a very light shade though? I painted mine a “light” shade of blue, but it looks darker when on the ceiling. Seeing your examples makes me want to do it over and get it right this time! Go with the blue. My best friend painted her porch ceiling blue and it is so calming. If I had a porch with a roof I would paint it blue in a heartbeat. You can always go to white later on if you want a change. Congrats on getting it done, your doing great on your list! You go girl. Blue, blue, blue! Loved my blue porch ceiling! How would blue look with the Coral door? What about a lighter peachy color to coordinate with the door? I don’t think I’d do blue with it, but that’s my personal choice! Blue like the sky only paler. Blue for sure. And be sure to pick a color lighter than what you think. It always looks waaay darker when it’s up on the ceiling. Definitely (light) blue! Besides looking pretty, it really does deter insects from building nests. (Supposedly, they think the blue is the sky.) Before we painted our porch ceiling light blue several summers ago, we had a constant problem with wasps/dirt daubers etc, building their nests on the (white) ceiling and it was always a mess to clean up the stains they left, even with the pressure washer. Since our ceiling has been blue, we have had ZERO insect nests and haven’t needed to pressure wash the ceiling even once. 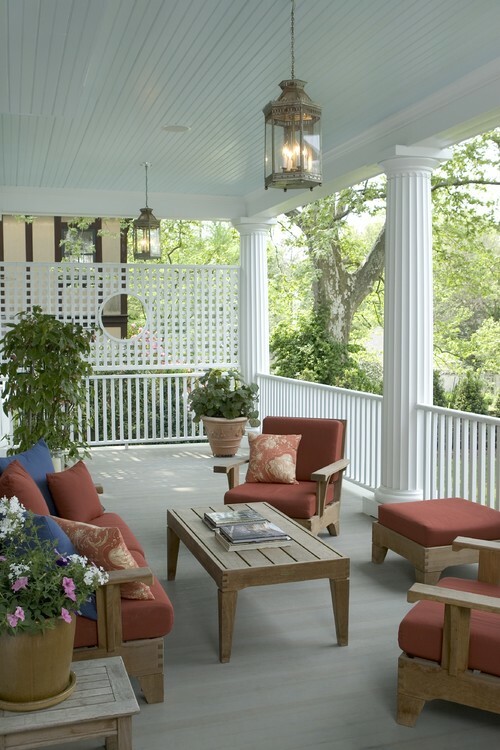 As “KathieB” mentioned, pick a shade lighter than you normally would for outdoor colors. Since the sun doesn’t reflect off of the ceiling, the color will appear darker up there. If have always wanted a pale blue porch ceiling! Nothing more charming in my humble opinion! 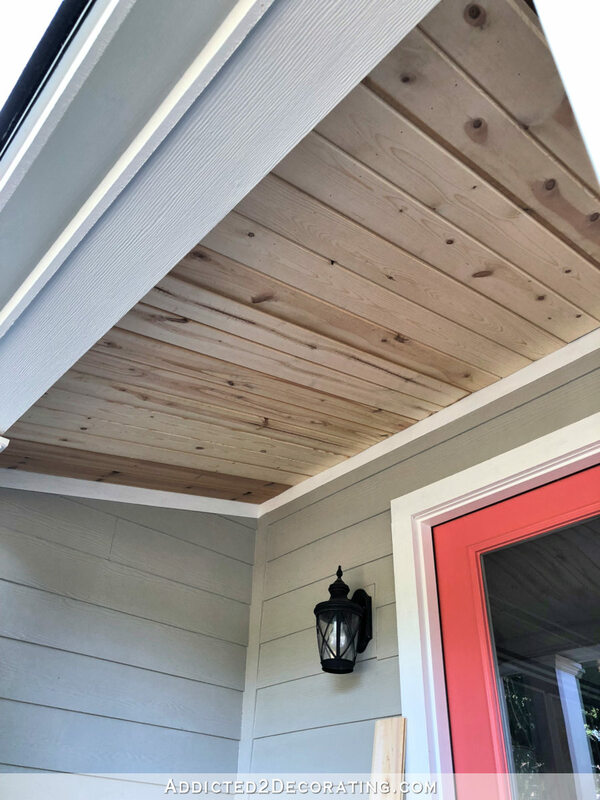 I love a blue porch ceiling but if you’re unsure you could prime it white (you will probably have to prime anyway with that bare wood) and see how you like it before you make the decision! That was my first thought! After it’s primed white, you’ll know better, but I to would go with light blue green like just a little above the horizon., and yes It really does help with wasps! You are going great guns on your lists! How is the carport coming? 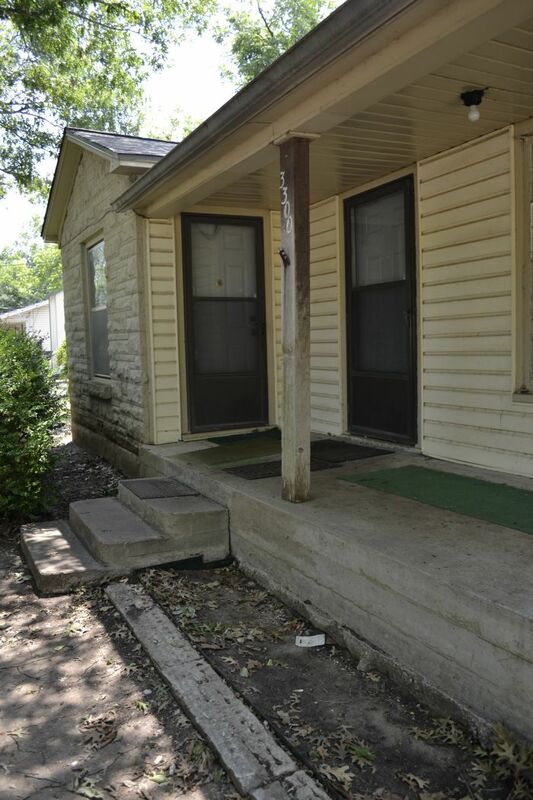 My front porch is going to get it soon, after the help comes to help replace a couple of boards that are weathered bad. Love my “haint blue” porch ceiling in northern Oklahoma! I love Haint Blue and I love the legend behind it. It’s just so charming and romantic. It also does seem to keep the bugs away, spiders anyway. We have a Haint Blue ceiling and no longer have any spider webs on our porch. I have a coral door, pale yellow siding, white trim and dark green shutters with white Victorian gingerbread and it looks stunning. Palest blue or blue green… the sky has every tint you can imagine, so you can always call it sky blue or haint blue, just the particular one you like best. 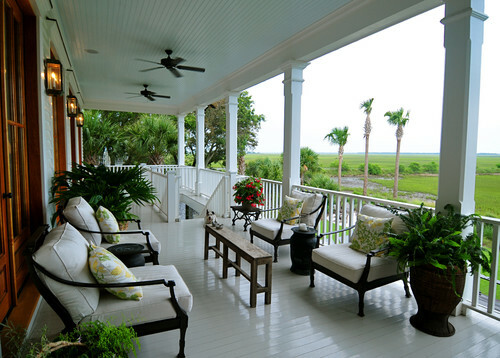 It’ll be wonderful with your coral door, and soothing to look at from those porch chairs. After I painted mine barely blue, not only did the wasps leave, the spiders don’t build nests in the corners, either. Can’t get the carpenter bees to leave a pale blue porch table alone though. Only one a year, but every year…go figure. I live in the Deep South and I love that the ceiling of my sunroom is painted a medium blue green color. To me, it has a more outdoorsy feel and it’s different. Behr seaglass is very pretty for a front porch ceiling. Behr waterfall is “bluer”. They are both from the Home decorators palette. We went with the seaglass and love it! Ever since I saw Sarah Richardson’s paint a kitchen ceiling light blue ( she called it a soft robin’s egg blur, but I don’t think it’s that intense) I was hooked. I’d love to have painted my porch ceiling blue but it’s vinyl and back then I had no idea it could be painted or have a lot blue installed from the get go. Anyhow, for me, pale blue it is! I bought sky blue paint for my porch ceiling a couple of years ago but I can’t face the neck and shoulder strain of painting over my head. If you haven’t already finished installing the ceiling boards why not paint first and install and touch up later? If you have used screws on the first boards it would be worth it to unscrew them to paint first. Save the strain on your poor shoulder. Paint the tongues and grooves on one pair first to be sure the paint layer doesn’t make the fit too tight. That would save having to use a brush on all the spaces between the boards. I have always said that laziness is the mother of invention. Whatever makes it easy on yourself. I used a blue color from Behr paint called Calm on my ceilings. Not sure it’s “haint,” but it’s surely close. I totally love it. Blue! Love a blue porch ceiling. 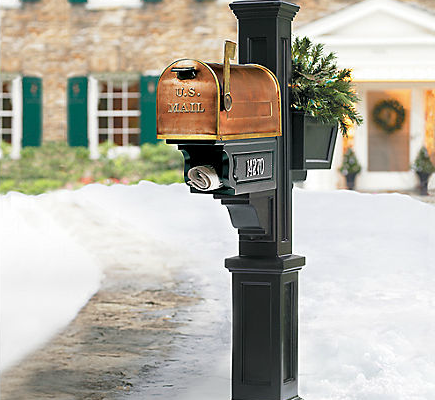 It will look so nice on your house. Light blue all the way!!! I grew up in Kansas and our big front porch always had a light blue ceiling… loved it! go for the blue. i love my blue ceilings on the front porches. Why didn’t you prime them first? Then it would be on all sides of the wood? A lot easier then to add the final coat. Why would I need to prime the side that doesn’t show? I could understand if it was going to be exposed to the elements, but it’s on the underside of the roof. 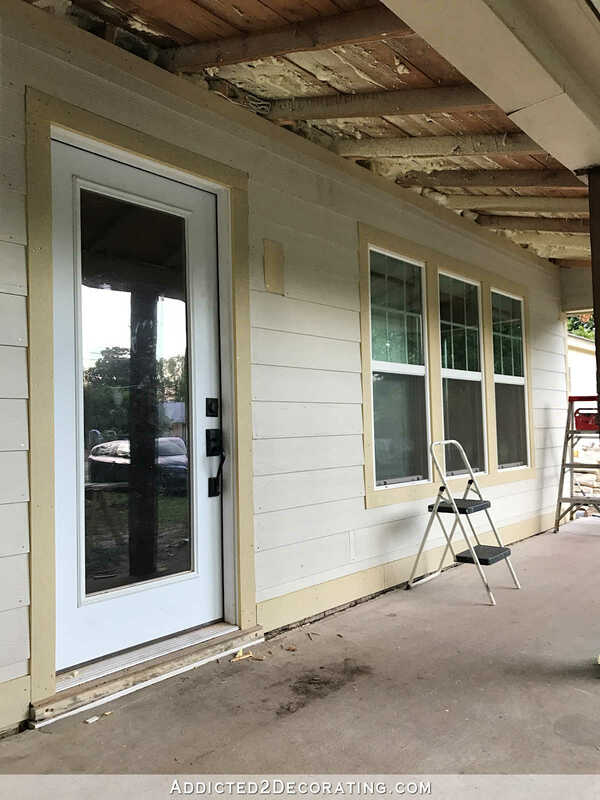 I don’t know about priming specifically, but I have read that outdoor wood elements should be painted or otherwise sealed on both sides so that the wood absorbs moisture uniformly and so will not cup or bow. 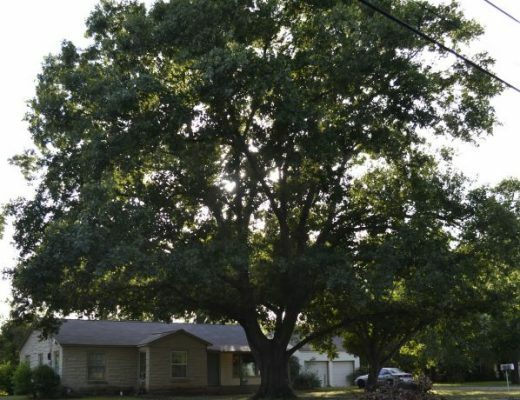 But I live in a moist climate; perhaps this doesn’t hold true in some place as dry as Texas. I have heard this same thing about the priming. I would make sure all sides are primed. Also, my vote is for VERY light blue. Prime it in white and you can then see if you will prefer to just keep it white or make the second coat your light blue. Northern Indiana here and light blue is very popular. I love a very light ice blue. Blue, one million times. White outside is a nightmare to keep pristine anywhere much less Texas. It will be beautiful. Sea Salt from SW is a nice light blue green. I used it in a master bath and a laundry room. It’s very pretty. I agree with most of the other commenters that the blue sounds lovely! Perhaps if you find some photos w/ similar color floor to yours, that could also help you decide. Lovely idea to go with blue. Very welcoming feel and sounds like there are practical advantages, too. Please use the haint blue. It’s lovely. Neat! I enjoyed reading about the history of “Haint Blue”. That was interesting and light blue green is a pretty color. And I thought at first that you had a type-o in your title! How unlike Kristi I was thinking. So glad your getting that porch ceiling done. Last year I had my house exterior & the porch ceilings painted with the same shade of blue in that first porch photo. The shutters were painted just one shade darker so they wouldn’t disappear. Trimmed out in white. I love it, so I vote BLUE! I’m going to be a bit of a wet blanket here and I apologize, I really do! I absolutely love the idea of a light blue ceiling, I think it would be gorgeous and I’m jealous that you have a covered porch to do that. But I really think the coral door clashes with everything you’ve done and are thinking about doing. I’m so sorry. 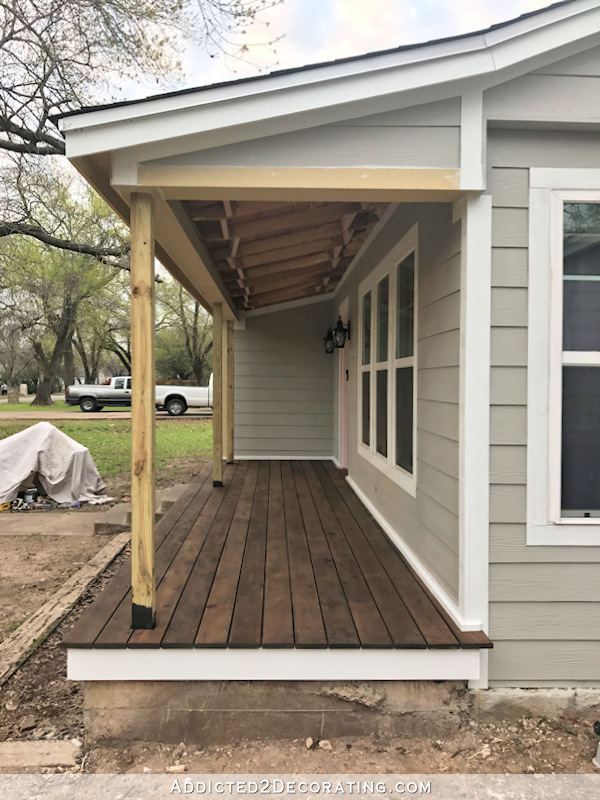 I’ve never really thought it looks great with the siding, porch flooring, or the pretty shutters. I think maybe white, another shade of blue or gray, or even yellow would look better! When you post an overall photo, the combination of colors makes me think of an off-color version of our flag. VERY pale blue is my vote! For whomever asked if there was a paint company that has Haint Blue, I discovered today that Dixie Belle Paint Company carries Haint Blue. It is a pretty light blue and they have many lovely colors. It is a very beautiful color, but I don’t know if Kristi would use it. The formulation is chalk paint and we all know how she feels about chalk paint! Not only that, it’s a really high price point of $140.00 for a gallon, which would make it a no-go as far as I am personally concerned. Blue would be my pick. I also need to ask a question. Would the critter spray painter work for inside walls if we cover floor and windows? And do you recommend it? This house needs to be painted before we move and we have very little time. Thank you! I would suggest purchasing one at Home Depot or Lowe’s. I know at Home Depot, they have them labeled for the projects you can use them for, like walls or furniture. I’ve seen lots of bloggers use and recommend one called something like Homerite (it may not be exactly that, but similar) that I think is available at Lowe’s. Oh the Haint Blue for sure! I’ve been on board with a haint blue ceiling for your porch since you first started working on it! Love everything about it, from the color (of course) to the legends. It’ll keep wasps AND evil spirits away, you can’t do much better than that LOL! I’m always impressed with what you are able to do yourself – and do so very well! I’m too traditional and would go white, but I think the blue would be lovely. Benjamin Moore Opal Essence. I haven’t used it outdoors, but it is lovely on my dining room ceiling. Blue, definitely! I’ve wanted Haint blue for your porch ceiling ever since you started working on it. I finally remembered I used SW Lauren’s Surprise for my “haint blue” ceiling in Oklahoma! Look into Benjamin Moore Wythe Blue, it’s my favorite blue/green paint color.